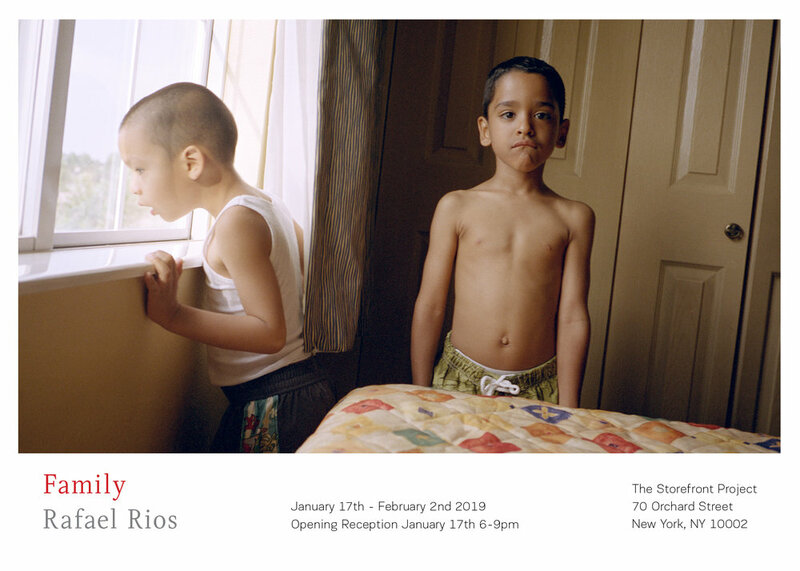 NEW YORK, NY (November 16, 2018) In the wake of America’s “zero tolerance” immigration policy, which led to the separation of numerous Latino immigrant families Brooklyn-bred, Puerto Rican photographer Rafael Rios’s impressive debut photo book entitled, Family comes at an important time in culture. Family is an intimate glimpse into Rios’s Nuyorican upbringing and is a time capsule that candidly captures the early 2000’s era, human connection, traditions, and Puerto Rican heritage. Rios who has shot for the likes of The New York Times, Supreme, Nike, Timberland, GQ Style and Paper Magazine among others is releasing the book with Baque Creative Press, which sets out to provide a platform for underrepresented creators. Founder Angelo Baque shares, "Rafael Rios has been a long time friend and I felt like it was my duty to honor this friendship by putting this body of work into the world. This book is an ode to the Latin American family and the Nuyorican and embodies an experience that both Rafael and I hold very dear. The photos in Rafael's book encapsulate the documentation that I wish I could have done for my own family." With his family as his first muse and inspiration, the book is a coming-of-age story of sorts that spans over the course of eight years and features a progression of Rios not only exploring his talent but also developing it. The images derive from 1999 when Rafael was 14 years old and first picked up the Minolta XG-M camera his mother bought for him from a Flatbush pawnshop then leading up to 2006 when he was a 23 years old college student fully committed to his future craft. Influenced by the work of famed French humanist photographer, Henri Cartier-Bresson and American photographer Tina Barney best known for her portraits of her family and friends, the book is a collection of 91 captivating color images across 117 pages that include portraits of cousins, great aunts, uncles, Brooklyn beach days, BBQs and even hospital visits. Rafael weaves together a poignant story of emotional bonds and family unity that unfolds through every image. The photos capture the beauty of a hard-working, multi-generational, blue-collar, immigrant family that happily shared a Fort Greene brownstone. child and second-generation Puerto Rican, he began shooting on a Minolta 35mm camera purchased from a local pawnshop at the age of 14. His talent was fostered while attending boarding school in Poughkeepsie, New York. Rafael spent his teenage weekends traveling home by Metro North train, to stay connected with his Fort Greene neighborhood and to document his family on film. Rios earned a BA in Visuals Arts from Hunter and afterwards working as an assistant for some of the industry’s top photographers while honing his craft. Across his work, whether personal or commissioned, Rios is known for a sensitive attention to character and environment that manifests in modern imagery with a candid elegance. His clients include The New York Times, Supreme, Nike, Timberland, GQ, Beat, Stussy and i-D.
ABOUT BAQUE CREATIVE PRESS: Established in late 2017, Baque Creative Press is the new publishing division of the multi-directional agency Baque Creative. Created in order to provide a platform to artists and creators who may not otherwise have means of entry to certain cultural spaces, Baque Creative Press’s goal is to support and visualize the diverse, vital global networks that the agency and its founder Angelo Baque play an active part in. With philosophies of access and education at its heart, the Press will devote its efforts to publishing thoughtful, limited-run edition monographs featuring the work of visual artists, frequently Baque’s close colleagues and longtime collaborators.